Give Clinton (and Gillard!) a break! Next time I hear someone say ‘Clinton and Trump are both terrible candidates’, or some variation on this theme, I will scream. Part of the reason I find this statement so annoying, so unhelpful, and so unfair to Clinton, is because I still have post-traumatic stress after seeing the same thing happen to Gillard, when she was painted as falsely-equivalent to Abbott. As a female leader or candidate, and as a progressive, there is a double layer of expectation. That expectation is that you are P-E-R-F-E-C-T in every way. So, for instance, if you, like Gillard, roll out over 300 pieces of perfectly legitimate, progressive and good-for-society policies and legislation, but there are one, two, maybe three things that you did which many progressives don’t agree with, you’re DEAD TO THEM. For Gillard, it was one of her decisions about asylum seekers, a change to single-parent welfare and/or opposition to gay marriage which are the only policy decisions some progressives seem to talk about, remember, hold against her, and cause them to say Gillard is just as bad as Abbott. For Clinton, it’s her email scandal. Or her ties to Wall Street. Apparently there is no leeway to say ‘oh well, Clinton’s not the perfect progressive candidate’, or ‘Gillard’s not the perfect progressive Prime Minister’, but also to accept they are still a good progressive leader. And far preferable to their loony right-wing contender. For the ‘they’re dead to me’ crowd, there is no grey in the black-white judgement about whether either is a legitimate candidate or leader. No matter what policies Clinton puts forward, her quest to continue Obama’s legacy in most policy areas, and in some to improve them, is ignored. Her haters just focus on the areas where they don’t agree with her. It’s incredible how all the good policies, ideas, hard-work, commitment and leadership ability that Clinton and Gillard bring to the table, counts for nothing for some people. There’s also the standard that ‘the woman did ok’ as long as she didn’t stuff up, such as many appraisals of Clinton’s debate performances. But for Trump, if he doesn’t stuff up, he’s the winner. The bar is just set lower for men. Now, I’m not saying it’s all a female thing, but I am saying females have encountered this problem before. For example, the expectation that female news readers are immaculate, thin, covered in make-up and definitely should not have grey hair. But men? Anything goes really. And what about the fact that Australian women are increasingly working just as many hours as men, but are still, in most families, doing the vast bulk of child care and household chores? Is this just a woman’s lot? For our female politicians, is it just their lot to be judged to be perfect or terrible, with no continuum, no balanced perspective, nothing in between? It’s impossible to ignore the gendered part of this equation. But there is also a ‘progressive versus conservative’ element. Put bluntly, most right-wing voters don’t give a crap about the policies right-wing candidates serve up, as long as they promise to reduce taxes. But for left-wingers, you’re not just expected to have a policy for every-occasion, pushing the boundaries of progress every second of the day, and also to know every detail of these thousands of policies, and how much they will cost, at a moment’s notice. When you try to explain policy details, you’re called ‘beige’ and ‘uninspiring’. Progressive leaders are also meant to live up to the hugely unrealistic expectation that they’ll win elections without making friends with business interests, while competing against the war-chest of business interests funding the neoliberal candidate on the right. So, for instance, Clinton is evil because she’s had paid speaking gigs for Wall Street bankers. No matter that she’s vowed to close tax-loopholes which see billions lost in corporate tax-evasion. No matter that she’s made wealth inequality the centrepiece of her ‘stronger together’ narrative. Because a New York Senator low and behold has some rich Wall Street supporters backing her campaign, she’s DEAD to many progressives. Sad, isn’t it? I adored Julia Gillard as Prime Minister, and still count her as my number one hero. I didn’t always agree with her, but I’m not naïve to think there will ever be a politician who I could possibly always agree with. It is so disappointing to now be watching Clinton, who, like Gillard, will never be perfect, but shouldn’t be expected to be, written off as ‘just as bad as Trump’. 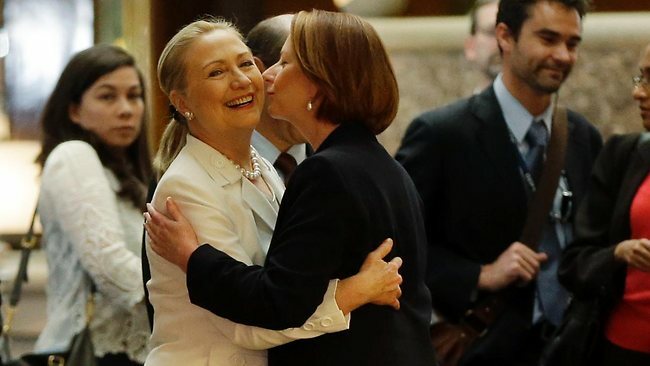 Comparing Gillard and Clinton to Abbott and Trump, for a progressive, is like comparing a slightly blemished apple with a rotten, maggot-filled orange. Those saying ‘Clinton and Trump are just as bad as each other’, apparently, would throw both pieces of fruit in the bin and go hungry in another act of counterproductive, Abbott-electing ridiculousness, rather than give Clinton, or Gillard, the credit they deserve. I will be excited when Clinton is elected as the first female US President. I will be critical of her decisions when justified, and appreciative of her good work when justified. As it should be. If the American votes have at least half a brain they should dump the trump and elect Mrs Clinton into the presidency. Oh yes didn’t the Australian media jump all over Julia Gillard when she was prime minister of Australia. Yes Julia new how to manage and communicate with the left and right independents thus passing legislation for the betterment of Australians. Then we got Rabbithead and Boxhead who only could split and spit at each other just like Rudd the Dud did towards a person who really knew how to negotiate with parliament’s hole box and dices mixed brains into a governing body. The Boxhead we have now when a tack is driven into his timber fibres it splits at the slightest touch in pain. Lets hope Hillary Clinton can get across the line and win for world peace. Otherwise we will end up with World War Three on our hands and we will all end up dead from its fallout contamination. As a lifelong Progressive, I was delighted to cast my absentee ballot for Hillary Clinton. The insights put forth by Ms Rollison here sum up my perspective on this Presidential election. Had it not the American MSM has a sociopathic obsession with false equivalence (and the mega-profits that this coincidentally generates), Clinton would have earned the largest Electoral College tally in over 3 decades. Even Deep South states like Georgia would’ve been tightly competitive for her. Today the FBI Director gave the MSM the gift that keeps on giving in the form of a content-free notice to Congress that they had found some emails on a laptop owned by the spouse of a senior Clinton staffer. The FBI has since anonymously leaked to reporters that the emails might not even be new ones and that their content is just as likely to be innocuous unclassified material. I remember when American journalists like Edward R. Murrow and even Walter Cronkite were widely respected for their assiduous adherence to factual analysis. Reading the headlines of the New York Times and listening to CNN’s infotainment network today, it was sickening how far and deep the Murdochisation of the American MSM has metastasised. If Progressives, particularly the younger ones, are blind to the vast difference between a highly competent, composed, and experienced centre-left leader such as Clinton and a divisive, bigoted, ignorant rightwing sociopath like Trump, then my native land is going to reap the whirlwind of class warfare against the most vulnerable members of American society as well as to give the green light for committing violent misogyny and racism on a scale not seen since the 1930s. Somehow I feel the same way in what you have stated that America will slip backward in time and not march forward as they should.